It's directly connected to Gongdeok station and has Lotte Super (grocery store) in the basement of the building, which is also connected to the subway station. Lotte Super is a smaller grocery store that carries fresh produce, meat and such.. They also have a few vendors inside, like a hotdog/sandwich/coffee eatery and a Japanese ramen/food vendor inside the grocery store. If you're looking for affordable fast food, you can check these out if you're in the area. The building also has Paris Baguette (bakery, cafe), coffee shops, and Korean, Chinese, Vietnamese restaurants in the lower floor. I suppose this hotel would be nice to stay in bc it has all of the necessities you would need in one building - also has health clinics and drugstore on the first upper floors. The location is also nice in that the "airport bus" stop is right across the street. 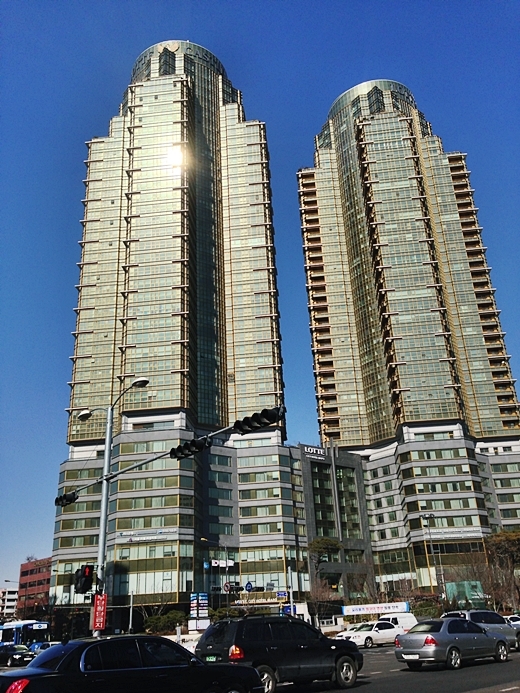 It is also in the center of Seoul - Myungdong, Insadong, Jongno are a minutes drive away. My only complaint about this area is that it is "nature less" - I would like a mountain behind :P too much to ask right?! Other than that, it is a very safe place to live in. You can feel safe walking at night since most of the stores/buildings are unoccupied by night since they are office/public buildings.